On March 13, Kiwa and DVGW CERT handed over the first certificates according to the voluntary assessment scheme for plastic multilayer piping systems for hot and cold drinking water inside buildings. This milestone took place at ISH trade fair in Frankfurt. The voluntary certification scheme for plastic multilayer piping systems for hot and cold drinking water inside buildings is a joint effort of Kiwa and DVGW CERT. It was initiated in close cooperation with TEPPFA, the Brussels based European trade association of plastic pipe and fittings manufacturers. The scheme aims to harmonize country specific certification schemes, thus reducing the testing, audit & certification efforts for the manufacturing industry. 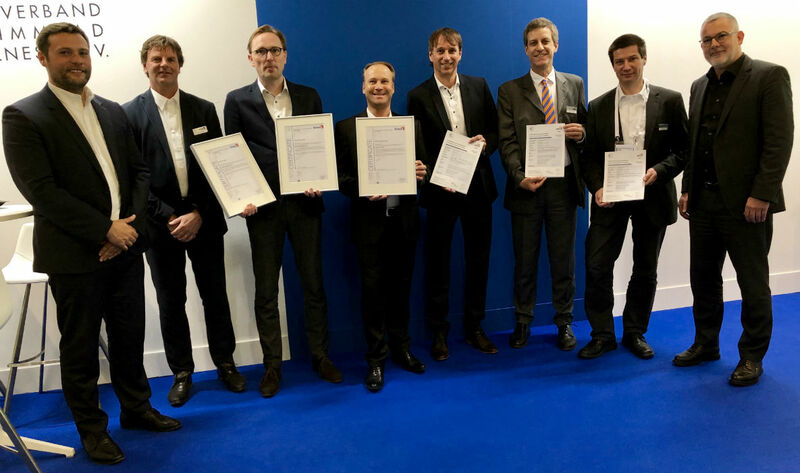 The presentation and handover of the first certificates to a number of businesses took place during the ISH trade fair in Frankfurt am Main, Germany on Wednesday, March 13 at the FIGAWA stand. Photo: First certificates handed over to Wavin, REHAU and Uponor. From left to right: Dragan Jovanov and Ronald Karel (Kiwa), Jan Elenbaas (Wavin Group B.V.), Jan Molterer and Horst Stimmelmayr (REHAU AG + Co), Joachim Rau (DVGW CERT GmbH), Markus Bohl (Uponor GmbH) and Volker Meyer (European Drinking Water (EDW). DVGW CERT and Kiwa signed a Memorandum of Understanding (MoU) on the voluntary certification scheme for plastic multilayer piping systems for hot and cold drinking water inside buildings. It marked the beginning of the voluntary assessment program in Europe in the area of multilayer piping systems, an effort to realize a transparent and harmonized certification scheme for plastics multilayer hot and cold drinking water pipe producers. The scheme is open: all individual European certification bodies and their associated test houses can join. Would you like more information? Please contact Leo van Driel, Kiwa, tel: +31 88 998 4484.